Arsenic is a pollutant that is present in groundwater, that can be found worldwide across the world. In fact, it is 20th most common element that is present under the ground by its number and 12th in the human body. 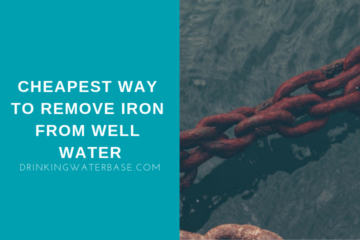 In this article, I will answer a question about how to remove arsenic from water at home and is it even possible to do so without the help of filters? If you don’t have time to read the whole article, here is the summary. Arsenic exists in 2 forms where one of those is harder to remove. Boiling will not remove Arsenic from water so the investment into filter is necessary. Reverse osmosis is a reliable way to remove arsenic at home, however certain pitcher filters are also able to do so. Why Arsenic Is Dangerous For Your Health? Which Regions In US Are Affected By Arsenic? How To Remove Arsenic At Home? Arsenic is widely used as an impregnating compound for wood and as a poison for weed, rats, and insects. Even in small concentrations, it is highly toxic to human. The natural presence of arsenic in water is so low that higher amount is usually associated in areas with metallurgical processes. Arsenic can get into the water with surface runoffs from agricultural sites, where poisonous substances that contained this element, might have been used. As said before, arsenic is a compound that can be naturally found in the ground. For this reason, people that are using the well are exposed to a higher risk of the water being contaminated. There are 2 forms of arsenic: trivalent As(III) and pentavalent As(V). Both types can be removed with the help of appropriate filtration I will talk about later. Before I actually discuss how to get rid of arsenic, I think it is a good idea to talk a bit about your health and why you might want to get rid of it. In the second half of the 20th century, it turned out that millions of people were poisoned by arsenic, without even suspecting it. The poison wasn’t from their enemies but from their own wells. This was the point where arsenic became a real environmental problem. Scientists have found that the excessive amount of arsenic has a negative impact on your body when exposed for an extended period of time to small doses. In particular, it can cause all sorts of disorders such as skin lesions and hyperpigmentation. The element negatively affects your nervous system, you might experience weakened memory or decrease of attention. Apart from that, the arsenic is cancerogenous. I won’t go into much details on this as there are lots of studies conducted that confirm what I am saying here. In 1942 the US Health Services established a maximum concentration of arsenic of 50 ug/l. This lasted up until 2006 because the epidemiological studies have shown that even that amount of arsenic in water is dangerous to health. Since then, the maximum allowance is 10 micrograms per liter (10 ug/l). The current state is that over 40 million people in the US are using well water as the source. A recent study showed that 2.1 million people in the US might be exposed to a dose that is above the allowed limit of 10 ug/l as shown on the picture below. As you can see that the west side around California and Northeast area are the most exposed to this element. This means that people located in these and other areas which are colored on the picture with brown color, should pay closer attention to their water source and ideally test the water, to be 100% sure. As I have mentioned earlier, there are two forms of arsenic. Both forms can be removed with the help of various types of purification – adsorption, tonal exchange, reverse osmosis, etc. Usually, As(III) is present in wells with a low amount of oxygen. Compared to As(V), trivalent arsenic is tougher to remove due to its charge. Uncharged As(III) particles couldn’t be effectively removed by adsorption, which is a way used by carbon filters. The more you know about the quality of water in your region, the more efficiently you can select an appropriate filtration system. So now we know, that As (III) is much harder to remove as it requires oxidation or other specific pre-treatment method. All owners of the well should understand that the amount of arsenic can vary throughout the year for various reasons. In a colloidal state, arsenic can be removed during normal water purification operations. According to the Federal norm, the total arsenic presence in the water of domestic supply systems should not exceed 0.1 mg/l as I said earlier. To answer the question whether the arsenic can be removed from water without the help of water filters at home? The answer is no and here is why. 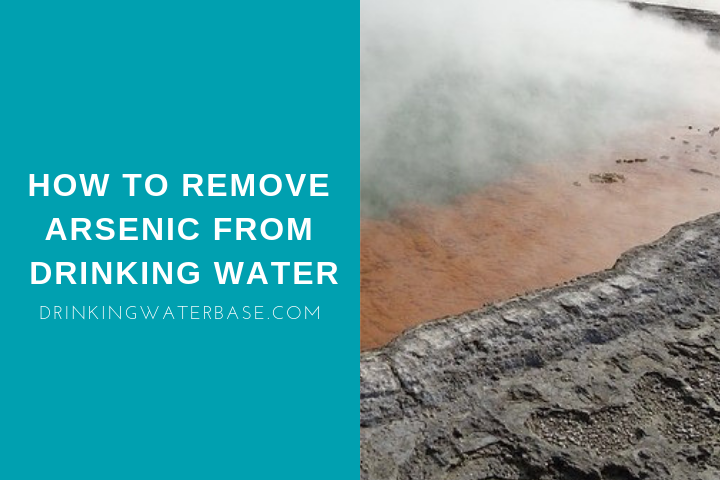 Some methods I have mentioned in another article, where I advise on how to remove chloramine, are not working with the arsenic. If you think that you might boil the water and this will remove the arsenic you are wrong. Boiling is not effective in a case with arsenic, and you will probably just waste the energy and money. The chlorination does not remove arsenic as well. So, the only thing that has been left, is to actually get a water filter. The ideal solution is to get the reverse osmosis system, however, if you are on the budget even simple pitcher filter will help you with arsenic. Another method that will work is ultra-filtration, distillation or ion exchange. I have written a full guide where I cover all the options and price ranges of filters available, so everyone can select a right product. Arsenic is a hazardous contaminant that should be removed from the water. It causes lots of health disorders and diseases. I feel awful when saying that there is not much you can do to remove this contaminant out of your water, but if you really care about your health, you will invest that amount to protect yourself. At the end of the day investment in the appropriate water filtration system will be much less than the health treatment bill you can get. Also, share your experiences with arsenic in the comment section below. What was the cause of the contamination in your area? What steps have you made to address the issue?